Tuesday, March 12, 2019 - Wednesday, March 13, 2019 at DoubleTree by Hilton San Antonio Downtown. Registration is now open and runs through 3/13/2019 10:59 PM Central Time (US & Canada). This workshop is beneficial to both healthcare workers and public health professionals. 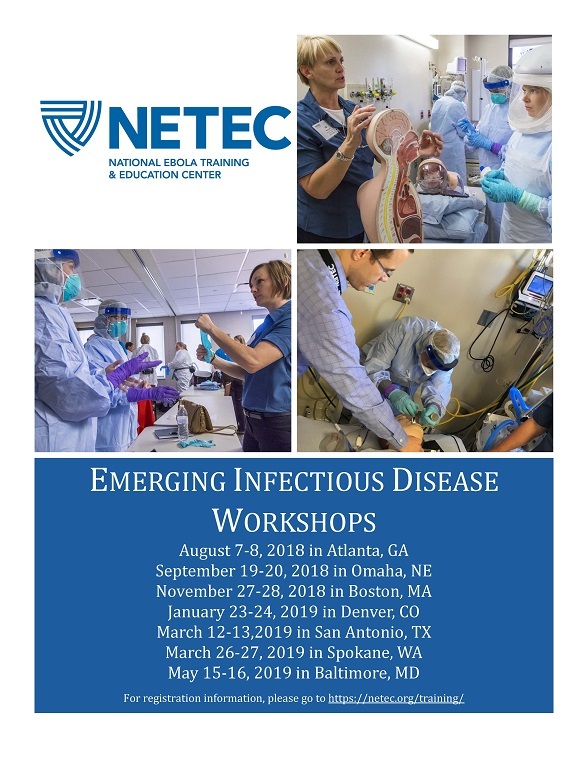 Hospital attendees may include, but are not limited to, medical, laboratory and/or nursing staff, administration, education/training leadership, and infection control leadership. Clinicians focused on special populations, such as Pediatrics and Labor and Delivery, can also benefit from this workshop. Attendees will have the opportunity to select from one of two tracks to attend during the workshop. Health Care and Public Health Leader: For clinical and operational decision makers, Emergency Managers, nursing and laboratory leadership. This track will focus on incident management, exercise planning and execution, public health concerns and concepts, and preparation of facilities and team. Clinical skills topics will vary by workshop location, and may include: specimen collection, peripheral IV insertion, urinary catheter placement, containment wrap for transport, and spills management. Participants selecting the Clinicians track or the optional Day 2 session: Laboratory Theory and Practice will be asked to bring the PPE ensemble their facility would use to assess or care for a patient with Ebola or another special pathogen. Each attendee will be wearing full PPE for 2 – 4 hours each day. PPE: This may include a PAPR, powered air purifying respirator, or a mask and face shield. See these CDC guidelines for more information on PPE for suspect or confirmed cases. 502 West Cesar E. Chavez Blvd. As a provider accredited by ACCME, the University of Nebraska Medical Center, Center for Continuing Education must ensure balance, objectivity, independence, and scientific rigor in its educational activities. Presenters are encouraged to provide a balanced view of therapeutic options by utilizing either generic names or the trade names of several to ensure impartiality. All presenters, planners, and others in a position to control continuing medical education content participating in a University of Nebraska Medical Center, Center for Continuing Education activity are required to disclose relationships with commercial interests. A commercial interest is any entity producing, marketing, re-selling, or distributing health care goods or services consumed by, or used on, patients. Disclosure of these commitments and/or relationships is included in activity materials so that participants in the activity may formulate their own judgments in interpreting its content and evaluating its recommendations. The following indicates the disclosure declaration information and the nature of those commercial relationships. All materials are included with the permission of the authors. The opinions expressed are those of the authors and are not to be construed as those of the University of Nebraska Medical Center, Center for Continuing Education.